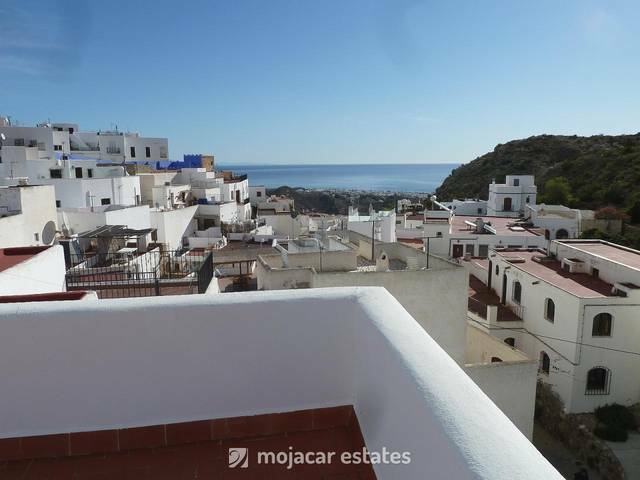 Apartment with one flight of stairs on the Moro Manco urbanisation on the Marina de la Torre golf course for sale in Mojacar, Costa Almeria, Andalusia. The covered terrace at the front measures 15m2 and overlooks the communal areas of the urbanisation. The property has 2 bedrooms and 1 bathroom. 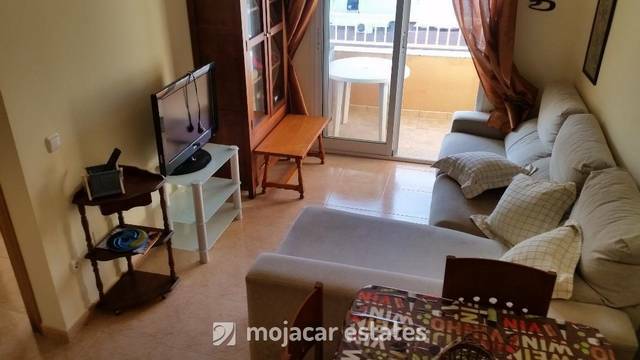 The large kitchen-diner is indepedent and leading off from here there is a utility patio of 2.35m2 with washing machine and boiler. The lounge is a good square size and there is centralised AC (hot and cold) throughout. The urbanisation has 2 communal swimming pools and the apartment comes with a numbered inside parking space. Ideal for golfers and for beach holiday rentals. On the above Google map click on enlarge map and the exact location of the property for sale in Mojacar Playa, Costa Almeria , Andalusia Spain is marked with the blue pin. It is located in Marina de la Torre Golf Resort, at the north end of Mojacar Playa, 1km aeay form the fishing village of Garrucha. Mojacar golf courses Macenas and Marina de la Torre, Vera golf courses Valle de Este, and Cuevas de Almanzora golf courses Desert Springs.